After turkey and mashed tatoes had been eaten, after Charades had been noisily taught to my grandfather’s girlfriend, we all settled back into quietude. My uncle Steve settled down to watch the Ravens play the 49ers. Grampa and his girlfriend went to their bedroom, as it was way past bedtime. My twin sister, Lacey, went to investigate the space heater. Dad went to wash dishes. Mom continued sitting in her chair, looking sleepy. “I would be very sad,” she said. “I barely even know what a twitter feed is,” Mom said. I don’t have a will. I thought about this for a moment. Next I asked my twin sister Lacey. I approached my dad, washing dishes. “Is that china?” I asked. “No, the dishwasher is full.” He gestured at the dishwasher, which was currently running. I spent my Thanksgiving morning researching the mass deportation and execution of the German Jewish population! Then I went and made charts of my data. I asked questions of the room as I was doing so. My Jewish grandfather was massively confused. “Aryans include muslims,” he kept saying. “We’re talking about Nazis,” we kept explaining. 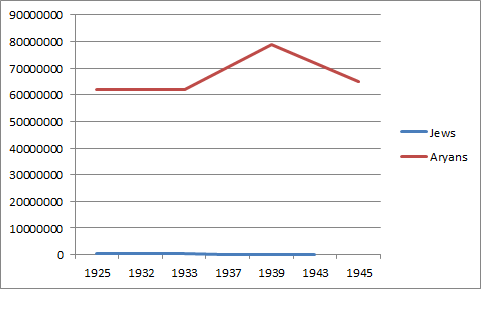 This is so you could see what I was getting at: the dramatic increase of overall German population, thanks to economic boom and Nazi encouragement to procreate, while you see the effects of mass deportation and execution of the Jewish population. All on one chart! ISN’T THAT CHEERY? ENJOY YOUR TURKEY EVERYONE! GLUCKLICHE TAGE DANKT ALLEN! The cool thing about the internet is the hypertext, and the ability to click links within articles. I know that sounds pretty obvious, but still. While the article about Google and Adobe and others getting hacked by China was pretty scary, I found this article, linked to by the scary article, to be really interesting. Basically, in order to be able to operate in China, Google allowed its search results to be censored there. But after the attacks (from China), Google decided to un-censor itself. As a ginormous company, Google operates as an independent country, basically. I remember listening to NPR about this earlier this year…I guess in response to the attacks? Or maybe they were also discussing Facebook? Anyway, the government has to deal with large, multi-national corporations just the same as they have to do with other governments. I wonder if, in 100 years, history students will be learning about the founding of Google in school. And the struggles in China. Well, presumably, they’ll be studying China. But will they learn about Google’s struggle in China? I’d have more of an idea if I listened to NPR more regularly. Also: there’s, uh, no screensaver tab on my Properties menu? Guys? So “ginormous” is in the dictionaries. That still doesn’t explain why “uncensor” isn’t. It should be obvious, right? I’m not insane? First things first (obviously). My topic is going to be the Nazi population control techniques, including their persecution of the Jews, their philosophy on motherhood, and actual population statistics to see how well they did. Second things second. How would I preserve [insert important topic here]? It says on the syllabus “Create a preservation path, describing any hardware, software, and processes needed, for your family’s historical record” but Prof Cohen said in class that it just had to be anything that was important to us. This is quite a lot, considering I did it all in a genealogy binge over the course of three months. In addition, the Conservation staff monitors the environmental conditions in Arvhives’ buildings in the Washington, DC, area; provide preservation training to Archives employees, contractors, and vendors who handle records; provide for the preservation of documents on exhibit in the Washington, DC, facilities; and, furnish technical advice and assistance to ensure the preservation of items lent for exhibition. That was from the paragraph on the Document Conservation Laboratory. The relevant part, I think, is in their second section, Special Media Preservation Library. is responsible for reformatting and duplicating records created on textual and nontextual formats. This includes duplicating motion picture film, still photos, microfilm, and sound and video recordings; microfilming paper records; reformatting audio and video recordings in obsolete formats that cannot be used on currently-available playback equipment; and, generating digital images of records. These program activities result in the removal of fragile records from use, while still providing access to their informational content by capturing the information in a new format. If I’m allowed to believe anything I hear on NPR, a lot of what they do is this, preserving and digitizing old analogue records. Some employees aren’t a fan, I guess because it’s gruntwork? I don’t know, but their employee satisfaction numbers are the lowest among government workers. I’m not going to lie: I really like microfilm. I think it’s a good, simple system. I think that in the future, After the End, post-Ragnarok and -Resurrection, the few meebly humans who are left to repopulate the earth will eventually be able to figure out that you just have to shine a light through the film and then blow it up with a microscope. I would like my records saved in microfilm format. My autobiography, my choices pictures of my family, pets, and art, my genealogy records, I would like all of that saved in microfilm format, and kept in a vacuum tube. They’ll be left with no idea what my dad looked like on his wedding day though. Just saying. 1) Why are we bothering? 2) Will we still be able to read the text? I noticed that while he’s going into excellent detail about the search for the how of preserving the internet for future historians, he hardly ever goes into the why. Is it because he assumes that anybody who would read his article would naturally agree that the internet is a thing worth preserving? There are things on the internet worth preserving, I agree. Emails have replaced letters and memos. We don’t want to lose those. Specific historical projects, notable blogs, (the entirety of twitter), but, well, let me show you a screenshot from one of my favorite comics, Dr. McNinja. In case you don’t want to look*, the human resistance managed to print out the internet — the entire internet — before dinosaurs shut down the internet for good. Dr. McNinja has to research and find something that will help the humans in the upcoming battle against the Brontosauran president. He finds himself surrounded by forum comments, in book form, by one guy, on the topic of Transformers. Which takes up at least that wall. While this works as a good metaphor for the difficulty of preserving the internet, it also leads one to ask — who cares what Sephiroth92 has to say about Transformers? I admit that my personal livejournal isn’t of interest to anyone except me, the future writer of my autobiography (after I finish my genealogy research). Will the historians of the future really care if one day I found my lizard cute because he stuck his tail up while he was eating, and the next day I swooned because he fell asleep on my lap? How many pictures of clouds does the future really need? As for my second question, I ask that because the language of the future is of particular interest to me. English is still evolving, even though we’ve managed to standardize it. I admit I found Pride and Prejudice difficult to read the first three first time I ever read it, and that book was only written two hundred years ago. What came across as light and fluffy reading in 1813 comes across as stiff, overly formal, and ridiculously verbose (and only sometimes she does it on purpose for a joke!). People need training to read Shakespeare. We actually have to translate early English. Language evolves, right? In 300 years the America we know today will be gone. What will be their cultural values? What will they read “ur so gay lol” as? There’s a project. It’s about the signs we should post around the nuclear waste facilities way off in the west. Nuclear waste has a huge half-life. Since we don’t know who will be living in America in 300 years, we need to find a way to warn them about this deadly chemical that will remain deadly for thousands of years. Would they see a biohazard…or an angel? If they see a sign that depicted someone touching the chemicals, then falling sick and dying, would they think “that’s superstitious nonsense”? Would they see these data servers, carrying our archives of the internet, and think them of any value? If all the electricity is gone, what good is keeping the internet around, anyway? *I recommend you do — or check out the original comics, they’re pg. 40-41 of “Futures Trading”. I’d start from the first comic though. EDIT: Here is where I first found out about the project: This Place Is Not A Place of Honor. A VERY interesting read. So I’m supposed to do a chart, yes? Wow am I behind. Anyway, today in History of Germany class I wondered if there was a chart on the population of the various German minorities post-WWI, during the Weimar Republic, and then at various points in the Nazi regime, and then finally post-WWII. Then I thought, “Well why don’t I just make one?” So I am. I’m going with the ethnic names of Jews, Afro-Germans, Gypsies, Homosexuals, and Aryans. I thought briefly about calling Aryans “Germans”, but then I realized that all of them are, in fact, Germans, so I went with Aryans because I couldn’t think of a better name. In case you’re wondering, January 1933 was the official Nazi takeover of Germany. 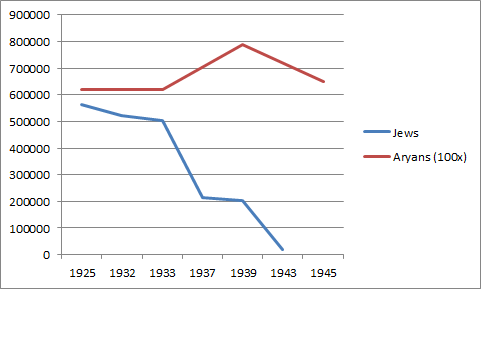 So if I wanted to look at the Jewish population, do I use the January 1933 amount, or the June 1933 amount? Thus far the only other data point I’ve been able to find is from another article on the same site, listing the 1925 German Jewish population as 564,973. Hm hm hm hm hm. Another article by the same site lists the 1933 Jewish population as 565,000. What’s up with that, guys? Maybe I should try a different site. 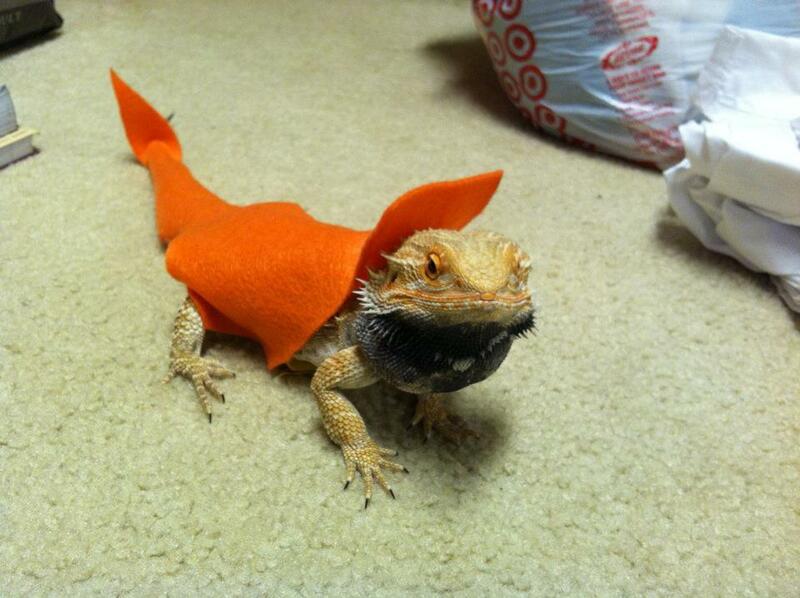 Well since everyone is so interested in lizard costumes, here’s my lizard, Sonny, dressed as Charmander. All that’s missing is the flames on the tail. Also Sonny hated his costume, as you can tell by the darkness of his beard. Hopefully in a week or two I’ll be able to add the final touches to the costumes.